As we approach the end of our first month of Rugby Stars, we’d like to reflect and pay thanks to the special children and parents who have helped us on our journey. Starting our first class on 27th January we had one dream in mind; to give back to local kids and the community. We saw 13 eager, enthusiastic children that day and as we approach our 5th session, our numbers have more than doubled, with many more trials booked in for future sessions. With thanks to the editor at the Kibworth Chronicle, we had a fantastic feature printed in the February edition (feature here) penned by Coach James. We also saw one of our paper adverts printed in the paper, which has now been seen by 1000’s of households in the local area. 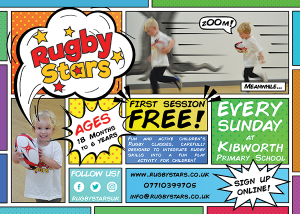 Our new flyers will be making their way around to local nurseries, pre-schools, schools and clubs. If you can help circulate our flyers and spread the word, this will help us to no end. Flyers can be picked up from any class. This will help us grow and improve the service we provide to each child. Not to mention the number of potential new friends each child can meet. Classes continue to be a fun and active experience for every child as we further develop our ideas. Coach Gregg is hard at work every week in his spare time, coming up with brand new ideas to challenge and build teamwork in our children. Hearing the great feedback from parents puts all our hard work into perspective. We work tirelessly to ensure every child enjoys each class. We appreciate the help of parents, getting involved in ball skills and learning to lead their child in an unfamiliar environment. Our ambition has always been to make Rugby Stars a family club and we hope that you are proud to join our growing family! We want to pay back our parents for referring friends to Rugby Stars, so be sure to check out our referral scheme, £5 vouchers for every new child that signs. We are committed to paying back the loyalty shown by our parents. We kindly ask that you please like and share our club on social media, and take a moment to review us on Google, and help us extend our club to every child in the community. We want to make Rugby accessible to all and this really helps us do that. If you can help review us on Google, this will help our search rankings, our growth and help us improve the service we provide. Every review matters! From all of us at Rugby Stars, thanks and here’s to the next month, and the many more to come after that!